Ever since I did that huge makeup declutter, I've managed to keep my foundations down to a healthy six. I could be a bit more stingy and narrow it even lower, but these six are quite different and really round-out my options for bases. Let's break them all down and give you the what's what. The newest foundation to the gang is the Make Up For Ever Ultra HD Invisible Cover Foundation. Make Up For Ever is a brand I've always squirted around and never quite dived into it, so this foundation is my first real taste. 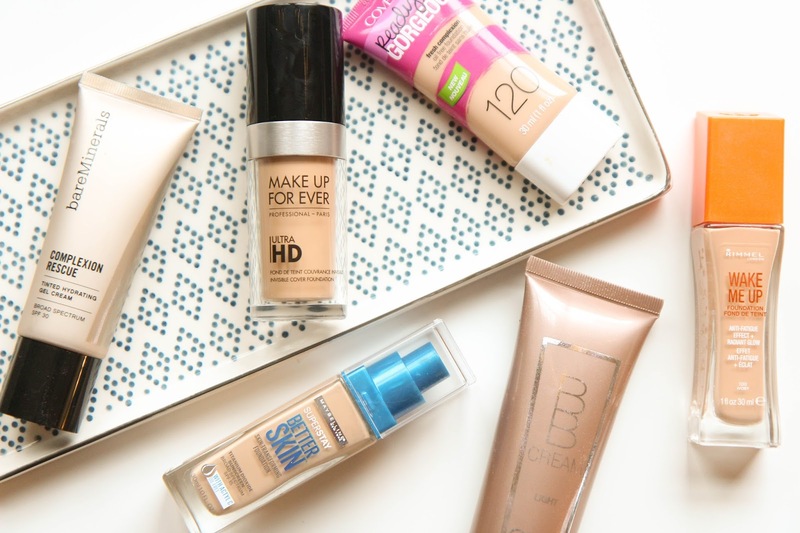 It's an in-between coverage foundation that can be built up or thinned out for whatever coverage you're looking for. It has a satin/matte like finish and great lasting power. I'm still not entirely sure if I've found the right shade match, but the experimentation continues and there's enough shade options I'm bound to find the right one! Another newish foundation is the Maybelline Superstay Better Skin Foundation. I find this to be quite like the Make Up For Ever one, but more matte. It's a great drugstore option though and the shade range is fair. It doesn't seem to last as long as the Make Up For Ever one either, but sits a bit lighter on the skin. My favorite drugstore foundation is currently the Covergirl Ready Set Gorgeous Foundation. It's a great light coverage, dewy option but definitely needs a good shake up if you haven't used it in a few weeks. I love this type of packaging for base products and it lasts a fair amount of time before needing some help. The Rimmel Wake Me Up Foundation has hung around and survived the declutter. It's one of those foundations that doesn't spark serious heart-eyed emojis, but is a solid foundation with a great medium coverage. It has a decent lasting power and leaves my skin feeling hydrated and fresh, not dry and cakey. Definitely worth keeping around in my book. Ah foundations. I can't wait to keep explore the product type and see where my wanderings take me.